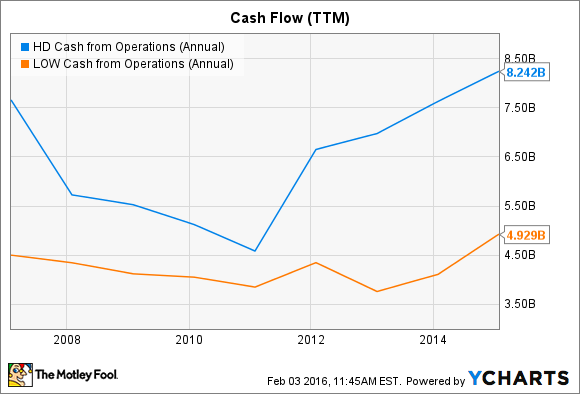 Better Dividend Stock: Home Depot Inc. or Lowe’s Companies Inc.? 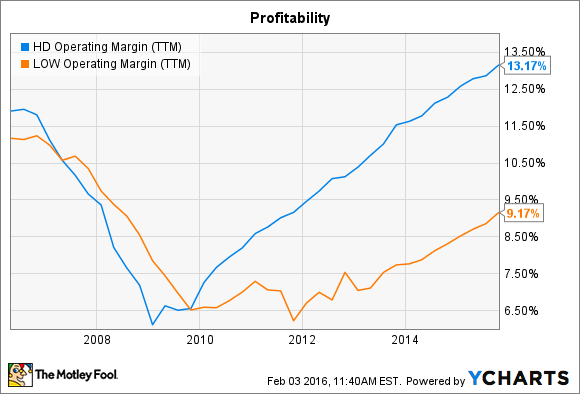 Comparing the two home improvement giants' growing dividends. If you're shopping for a growing dividend, you're bound to bump up against rival retailers Home Depot (NYSE:HD) and Lowe's (NYSE:LOW), who last hiked their payouts by 26% and 21%, respectively. The home improvement giants' record profits also point to double-digit dividend raises in the year ahead. So let's compare the two payouts to see which one income investors should prefer right now. Profit growth is expected for calendar year 2015. Data source: S&P Capital IQ. At a glance, it looks like a toss-up. Both companies yield just shy of 2%. Each payout ratio is substantial, meaning that management prioritizes returning cash to shareholders, but also low enough that dividends could rise before soaking up 50% of earnings. But to really evaluate the strength of these dividends, you have to consider the retailer's operating results. On most of the key retailing operating metrics, Home Depot has its smaller rival beat. Sales at existing locations were up 6% last quarter, vs. a 5% rise for Lowe's. That gap has held up for years, as Home Depot booked 6% higher comps in 2014, compared to a 4% increase at Lowe's. While checkout lines are long at both chains, the customer-traffic crown goes to Home Depot. That's why even in years like 2015, where Lowe's is expected to boost profits at a slightly higher pace, Home Depot shareholders don't have to worry that their dividend hikes will fall far behind. Cash generation is strong for both companies, but the edge again goes to Home Depot. Its operating cash flow soared 18% over the last nine months, up to $7.4 billion as Lowe's cash flow ticked lower by 3% to $4.5 billion. Both companies have major spending commitments, including plowing money back into the business. As it has already finished expanding its store base, Home Depot doesn't direct much investing that way, but it still spends heavily in areas like e-commerce shipping fulfillment. Lowe's isn't done growing yet, with as many as 20 new locations set to open in the next year. Finally, Home Depot's management appears more commited to delivering cash to shareholders through dividends rather than stock repurchases. In the last nine months, the company has directed $2.3 billion, or 32% of total cash returns, toward the dividend payout. In contrast, Lowe's has spent just $700 million, or 17% of its total, on dividends while the remaining 83% of cash returns -- $3.4 billion -- went to share buybacks. Ultimately, both dividends are well covered by improving operating results, and Home Depot is just as likely as Lowe's to announce a significant boost to its payout this year. But for the best shot at long-term dividend appreciation, Home Depot seems like the right choice for income investors who want exposure to the home improvement market.